Illustrated Farm Journal for Full Plate Farm. 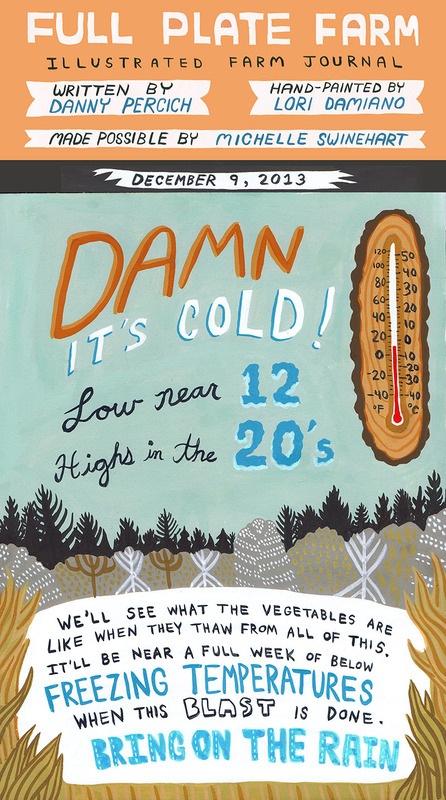 Full Plate Farm is a winter CSA farm located in Ridgefield Washington. In their 2013/14 season they launched a 'Farm Seeks Artist' program wherein they would trade vegetables with artists who proposed a project with the farm. 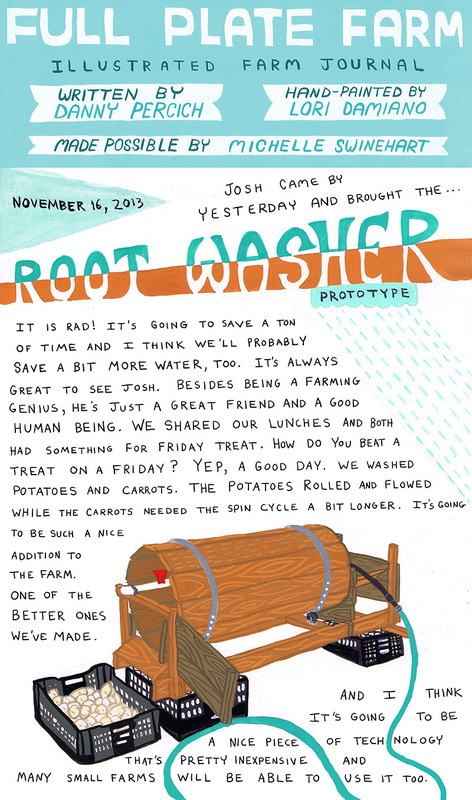 I proposed an Illustrated Farm Journal wherein I would work with farmer Danny Percich to hand-paint and illustrate a selection of his farm journal entries. I hoped that this would allow the CSA members a special kind of insight into the behind the scenes of that season on the farm. Full Plate Farmers, Danny Percich & Michelle Swinehart launched an exciting project during their 2013/14 winter CSA season called 'FARM SEEKS ARTIST'. Michelle had the idea to invite artists to engage with the farm and CSA. This could take place at the farm or CSA drop sites. It could be food-based, object-based, conversation-based, research-based, etc. The artist(s) would receive a bounty of beautiful and delicious vegetables in exchange for their engagement with the farm. As far as I was concerned, this sort of deal was what dreams are made of! I jumped at the chance to propose a project. Inspired by seeing the farm journals of my Grandpa & Great Grandpa I proposed collaborating with Danny to produce an illustrated version of his farm journal. He sent me his notes throughout the season and I selected entries I thought would give insight into the goings on at the farm for the CSA members. Because I have been given a porthole into the history of my own family through the farm journals of my ancestors, I also was especially interested in documenting moments during this season that would mark a very specific time in the life of this young farm and the people and family who were working hard to help it grow. I am excited to report that we are continuing this tradition for a fourth season! This project was organized by Michelle Swinehart at The Portland Art Museum. It was inspired by a current print show called Feast and Famine featuring works depicting people and food - from fields to tables starting in the 1800s up to the present. The idea for this dinner project was to bring small groups together (two sittings of around 20 people) and share a small meal made from potatoes. 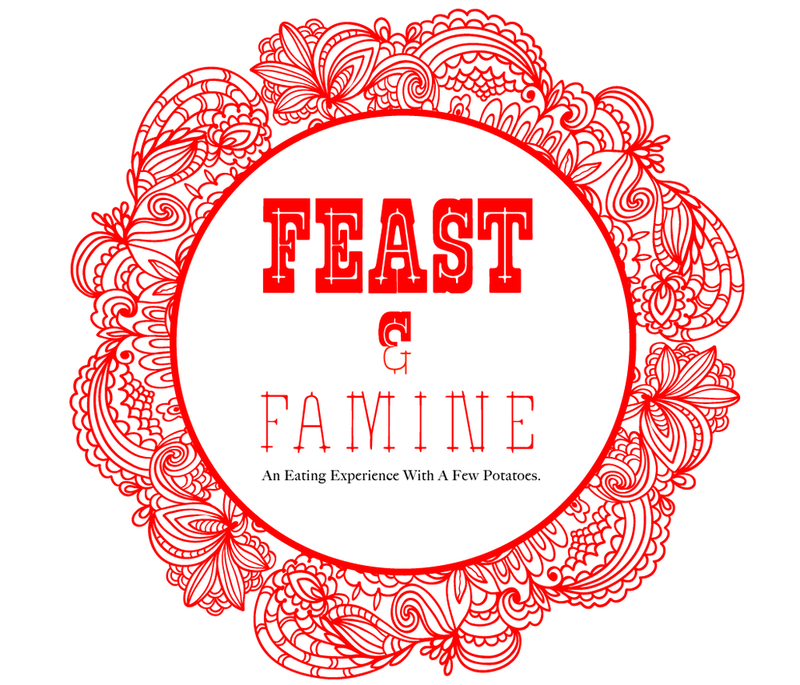 A chef prepared two courses using potatoes as the main ingredient - one inspired by Feast and another by Famine. Folks from Merit Badge were mixing a potato-based cocktail. In addition to the curator from the print show, there were also local potato farmers in attendance to talk about raising potatoes and answer questions. 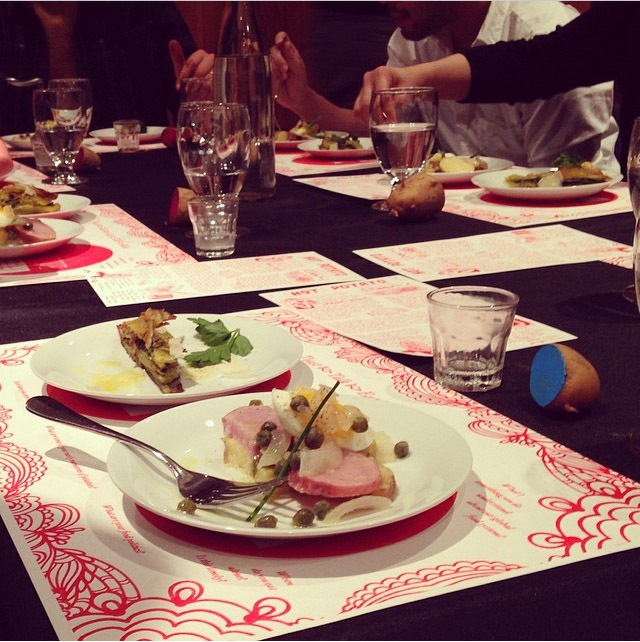 Together the groups discussed food as a source for sustenance and opulence, greed and loneliness, conversation and revolution. 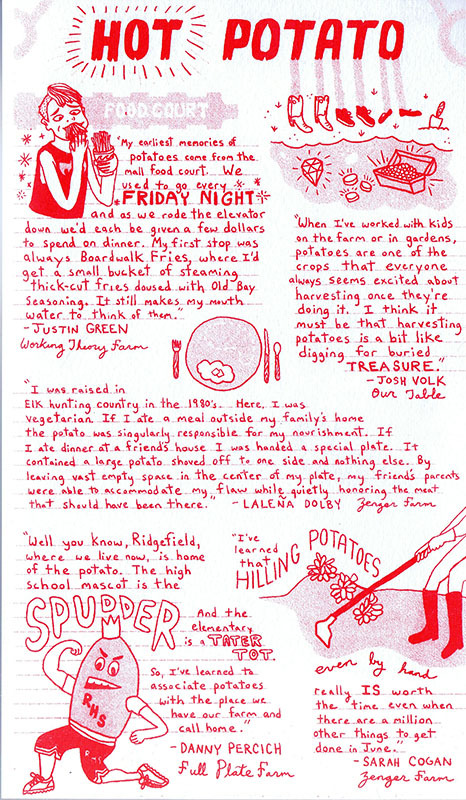 Michelle invited me to take excerpts from interviews she had conducted with local potato farmers and create an illustration to go along with hand-lettered quotes. This artwork was later risograph printed by Jason Sturgill and placed at each table setting along with placemats he designed and printed. Here is the print of my artwork and some photos from that night taken by Jason & Sarah Sturgill.